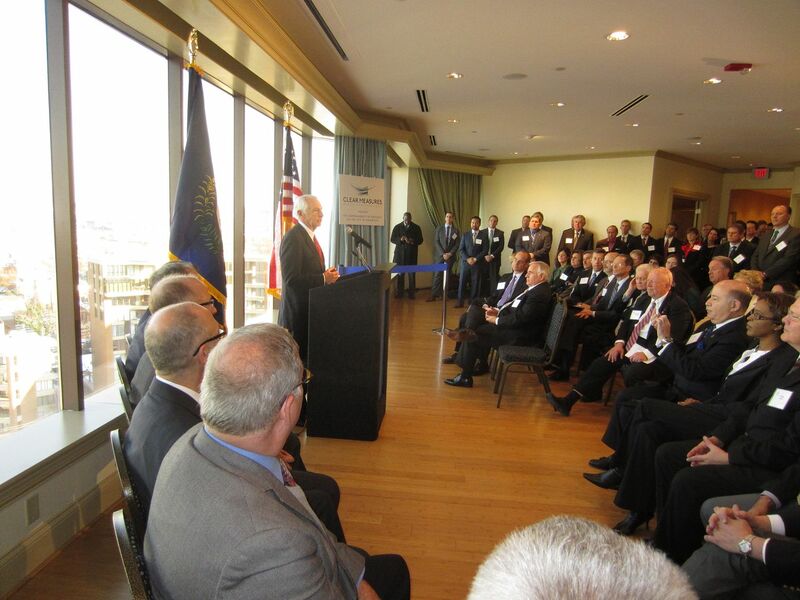 It was a busy stretch of nearly four hours in Covington for Kentucky Governor Steve Beshear on Wednesday, who announced at his last of three stops that three hundred forty-one jobs would be created at the RiverCenter towers over the next three years. Many of those jobs will be placed in the space formerly occupied by Omnicare, the health care supplies giant that moved from Covington to Cincinnati in 2011. Beshear cut ribbons at Xcelrated Learning Dynamics (XLD) ad Clear Measures, spawns of two existing companies located in the towers. Between the new jobs and expansion of the parent companies, Tier One Performance Solutions and dba Direct, respectively, will result in the total of 341 jobs. 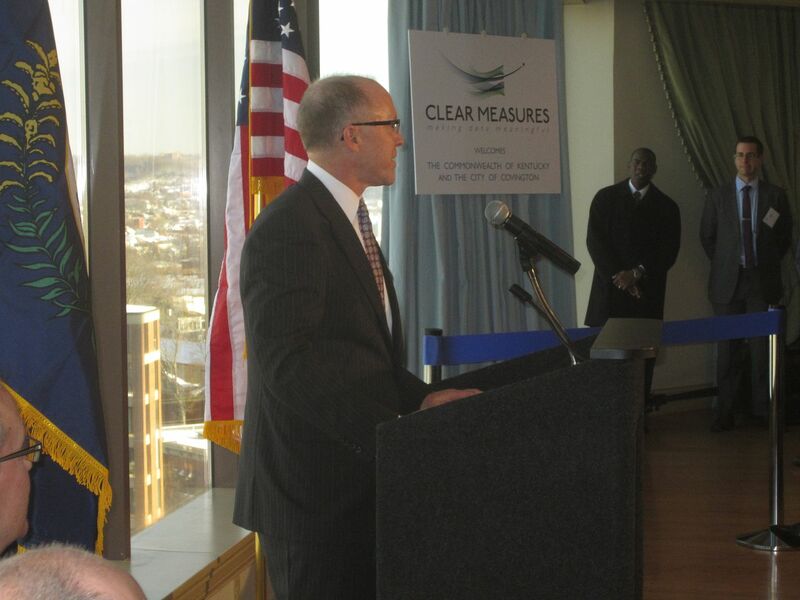 Clear Measures is locating 121 jobs in Covington, with a projection of adding 60 additional jobs in the next three years, bringing its total employment to 181. Clear Measures involves two local IT firms, Lucrum and dbaDIRECT (which moved to Covington from Florence over the summer), providing IT infrastructure management services to the financial services, retail, health care and education industries. Clear Measures will provide strategic management consulting, scalable IT project support, staff augmentation and infrastructure management services across the globe. Clear Measures will also build, manage and enhance systems that make data meaningful. Xcelerated Learning Dynamics is creating up to 50 jobs in the next three years. The company is transforming health care education by helping organizations elevate their performance with efficient and effective learning programs, said co-founder and Covington resident Normand Desmarais. XLD was launched from Covington-based TiER1 Performance Solutions in 2012 to help hospital systems meet the emerging challenges of health care reform by quickly aligning their workforces with the rapidly evolving Affordable Care Act. TiER1 has recently located 70 jobs to the RiverCenter and is planning to add 40 more in the next three years. Desmarais said that pilot programs were tested at St. Elizabeth Hospital and in Louisville and that the reports came back recently. "The data is good and we're going national in 2014," Desmarais told the packed house of local civic and business leaders in the RiverCenter Towers. Both Tier One and dba Direct started out in the Northern Kentucky e-zone on Madison Avenue and each thanked Casey Barach, the leader of that organization. The expansion of the firms raises the hopes that Covington and Northern Kentucky could become a major hub for informatics and technology entrepreneurs in the Midwest. "Informatics is a fancy and concise way to describe how computers and smart people retrieve data," Beshear told the room. "We've got three companies that are very good at it." Northern Kentucky University, in recent years, opened its College of Informatics and the ambitious building that houses the programs, Griffin Hall. Desmarais said that his new venture recently hired eight graduates of the program with several other prospective hires in the pipeline, including some from Gateway Community & Technical College where Tier One helped develop an instructional design program. And the hiring won't stop there, he said. "We're going to create hundreds of new jobs in the state of Kentucky over the next few years," Desmarais emphasized. Tier One, and now XLD, are homegrown success stories, something that the business leader is proud and cognizant of. "Being in Kentucky is a very special thing for many of us. This is (wife Lisa and his) adopted state. We've been here twenty years and we'll never leave this state again." Tier One has done its share of moving as it expanded from the e-zone to the Odd Fellows Hall to its current home in RiverCenter at the edge of the Ohio River overlooking Cincinnati. "This is as far north as we're going to go, Governor," Desmarais said. Covington City Commissioner Steve Frank, speaking on behalf of Mayor Sherry Carran who is at a mayors conference in Louisiana, called Wednesday a "big day for Covington". "We plan on being excellent hosts and are excited for you to grow your businesses here," Frank said. He called the city a "high tech entrepreneurial hub". "I think we have one of the best in the Midwest." Other regional leaders weighed in on the announcement in a news release. “Covington’s renaissance is underway and our reputation as a technology hub in Kentucky and the greater Cincinnati region is exemplified by these two high-tech­ informatics companies who chose our city for their headquarters,” said Mayor Sherry Carran in the news release. Governor Beshear's additional stops on Wednesday included a speech before the Northern Kentucky Chamber of Commerce and the groundbreaking for the Kentucky Career Center on the 1300 block of Madison Avenue where Robke Chevrolet once operated. Those stories will follow here at The River City News.